Quake made its long-awaited return to modern gaming last year with Quake Champions, a hero-style take on the grandfather of the competitive-FPS scene. Drawing inspiration from the likes of other recent popular shooters, Quake Champions give each of its iconic heroes extra personality, character-specific traits and individual time-based abilities. 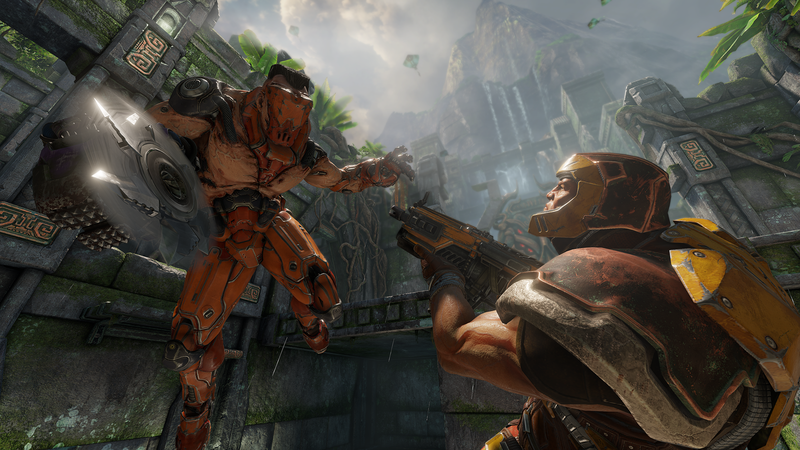 The look and mechanics may have seen some radical changes since 2010’s Quake Live, but the trademarks of the series live on through Quake Champions‘s intense speed and unforgiving skill-based gameplay. During today’s QuakeCon 2018 keynote, Community Managers Joshua Boyle and Andre Carlos gave attendees and broadcast viewers a brief update on the current status of Quake Champions. Apart from the reminder of this weekends tournaments, Boyle and Carlos announced that Quake Champions will now be free to play, whether players are playing through Steam or Bethesda.net. It should be noted that “free” means that Quake Champions is free to download; akin to the Xbox One and Windows 10 installment of the Killer Instinct franchise, anyone may download the title free of charge and begin earning additional characters through gameplay, but the option to purchase the “Starter Pack” or “Champions Pack” as a fast-unlock will still exist. To celebrate, id and Bethesda released a new trailer that commemorates the legacy of Quake, showcasing gameplay from both the original 1996 Quake and today’s Quake Champions a staggering 22 years later. Quake Champions is currently available for free as an Early Access title for PC through Steam and Bethesda.net.